eHarmony mobile is one of the hottest dating mobile sites on the market. Their mobile site is home to over 1,000,000 online dating singles who enjoy a welcoming design and a great navigational setup. Now the eHarmony mobile site works on most mobile devices: Android, iPhone, iPad, Windows Mobile, and all of their supported tablet and mobile platforms. Latest updates for the mobile app from eHarmony have been rolled out on June 2015 and have included bug fixes which make functionality much quicker. To access eHarmony mobile go to https://m.eharmony.com/ from your device. New customers should know that both the mobile site and apps are completely free to join. The eHarmony mobile site is one of our favorites. It’s got an easy to use layout, quick and simple touch navigation, the new update made the site load quickly and function better, and it is built in accordance to a pleasing color scheme. Users can search for matches online, view profiles of other singles looking to date in their area, send smiles to other members, and go through the relationship questionnaire in no time. 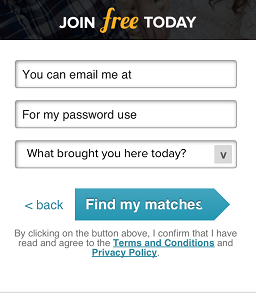 To login to the mobile site simply visit http://www.eharmony.com/ on your mobile device. The site will recognize your mobile device be it android, iPhone, a tablet or Windows Phone and will function just as the regular desktop site does. Then just touch the Login button at the top right of the screen and enter your username and password. Once you are on the mobile eHarmony site you should then fill out the easy form and create your login user and your password. eHarmony mobile site has been available for a few years now. It is a premium dating service which helps over 400 people get married each day! the website was launched in 2000, by founder and CEO Dr. Neil Clark Warren and has quickly become the USA number 1 trusted relationship services provider. Today eHarmony serves over 1 million members and helps them find relationship matches in their area and around the world. To join this trusted dating site visit eharmony.com on your mobile. eHarmony is located in Santa Monica in the USA and has been established on the notion that people should enter into a relationship based on compatibility. This is why they have created their patented compatibility matching system – which allows singles looking to date online to answer a few questions and then fits likely matching members to one another based on this tailored questionnaire. 1. Is the mobile site secure? Yes it is eHarmony has invested heavily in the security of its users and keeps all personal information safe. 2. Can I access eHarmony mobile from more than one device? Sure! a mobile site is accessible to all mobile phones. On which mobile phone or tablet will eHarmony mobile work? Local dating, asian dating, senior dating, Hispanic dating, Jewish dating, Christian dating and much much more.